Every day is special with a houseful of little children. I like to end our days in a special way. After every child gets ready for bed, we sit down together and read a chapter from the Bible. We are currently in John. Then I read them a chapter from a special book about the things of the Lord. Tonight we read Little Pillows and Morning Bells , which the children love, as it teaches them more about their blessed Saviour. Sometimes we read Pearables Kingdom Stories , which uses creative stories to teach godly morals. It makes me so thankful for this quiet time with them, and that there are good things to read to them to enrich their faith and encourage them, and give them something sweet to think about as they fall asleep. I love this! Our lives have been so blessed by books and stories and by the Word of God! Thank you for sharing! Sounds perfect to me and I am sure the children go to sleep with sweet dreams. Far better than what most modern children go to sleep - watching horrible things on TV or looking at on the computer. Amen, nothing more blessed than a home full of children, sounds like a perfect day to me. 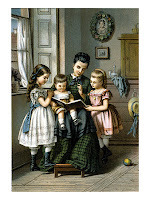 Oh, how I miss the wonderful days of reading to my children!! Dear friend, you are indeed a very blessed mother - and a wise mother to end the day like this. What a great heritage you are passing on to your little ones - and what sweet memories they will always have of this time of their lives! Have a lovely week full of blessings in Christ. I would have to say Amen, also! What a perfect way to end a day with the reading of God's Word and one of your children's favorite books. I so love reading to our grandson when we visit him. I shall have to purchase those books and send them to my daughter. Thanks so much for that information. Have a blessed day! Truely a wonderful way to end the day!!! Quiet time building lovely memories.